We’re (once again) in the grips of a drought. It seems most years in the past 7-8 our little homestead has struggled with terrible drought conditions. The weathermen are finally predicting precious rainfall to bless us for the next several days. Oh it won’t break our drought, but at this point we’ll take that tiny 1/8th inch that falls – ANYTHING! I’ve got an easy way to track our rainfall which I find quite clever. Oh sure I could measure the rain gauge contents and jot them down. Then I could make note in a calendar to track. But I just never find time to enter it all or even remember to enter it. But this Homestead Hack assures I’ll be able to easily document and track our rainfall throughout the year. We have one of those large easy-to-see rain gauges installed on our back fence. We can see it from our back window to get a general idea of how much rain has fallen. But to track it week-to-week or month-to-month here’s my easy hack. I always have my phone with me since I never know when I’ll see a beautiful butterfly or an amazing sunrise. So I my phone with it’s built-in camera is always in my pocket. When I go out to empty the rain gauge I snap a quick photo of it first, then dump it out. Later when I download the photos from my phone, I’ll see that photo of a rain gauge. I drag it into my folder on my computer’s desktop titled “Rain”. That folder automatically sorts photos by date taken. If I don’t need to track the last rain fell I just leave the photos accumulating in that folder. 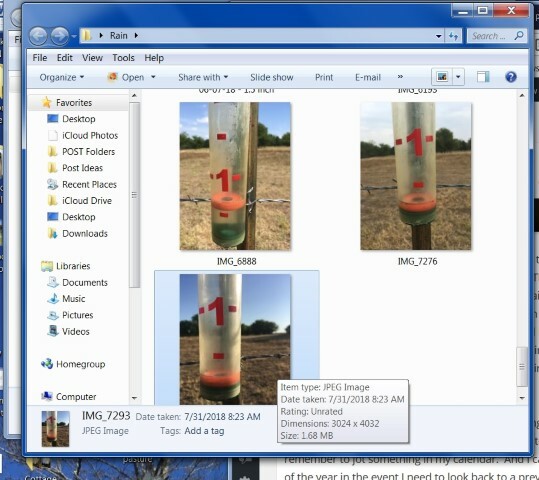 But if I get to wondering when the last rain fell and how much, I can open the folder & hover over the last photo, the date taken pops up on my screen. I can tell how much is in the gauge just by glancing at the image – no need to open it. But if I’m tracking more closely I’ll sometimes amend the names of the images to “Date Taken – Rain Measure” which will also sort for me since date taken is noted first. Then I don’t even have to hover over the photo. This works well for me because: 1) I’m always taking pictures anyway. 2) I always download photos from my phone, and 3) I don’t always need to track rainfall, so it’s easier than trying to remember to jot something in my calendar. And I can tuck them all into a sub-folder at the end of the year in the event I need to look back to a previous year. 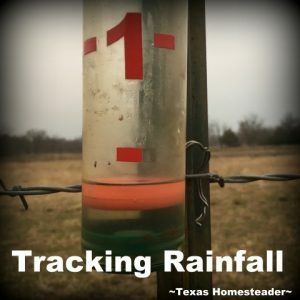 So if, like me, you’re not quite ready to plunk down the cash for an electronic rainfall tracker and you’re tracking old school, give this method a try. 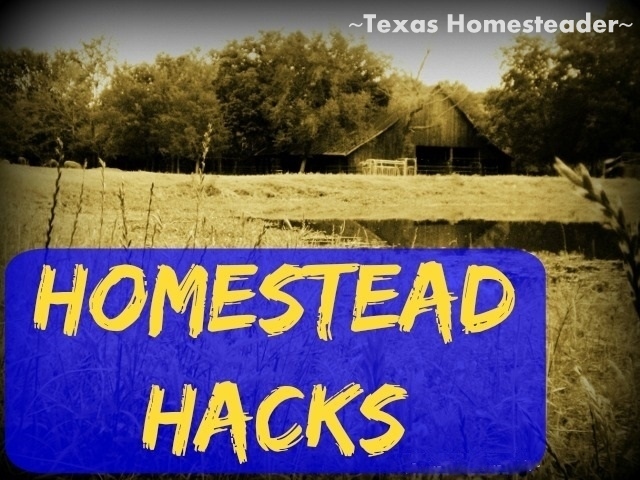 This entry was posted in Blog Posts and tagged Homestead Hacks, weather on August 9, 2018 by Texas Homesteader.